Captain John Vigiano is now retired and is a consultant. 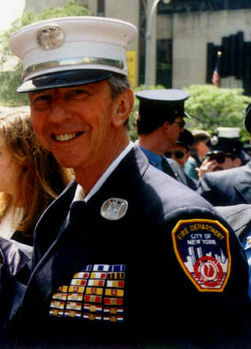 John T. Vigiano is a retired Captain of the New York City Fire Department, with over 38 years of service. His career started in 1962 with Ladder Company 103 in the East New York - Brownsville section of Brooklyn. He transferred to Rescue Company 2 for a short period but returned to Ladder 103 until his promotion to Lieutenant in 1976.
until his transfer to Rescue Company 2 in 1977. He remained in Rescue Company 2 until his promotion to Captain in 1988. Ladder Company 176, "The Tin-House Truck" where is he retired as the Company Commander in May of 1998. John is a graduate of John Jay College with a Bachelors Degree in Fire Science. He is also a Certified New York State Instructor who was an Adjunct Instructor to the New York State First Line Supervisors Training Program. He was also an adjunct instructor for the Captains Management - Training Program for the New York City Fire Department. In addition to his full time fire career, John also worked for the Suffolk County Fire Training Academy for over 14 years. Where he designed and wrote the Heavy Rescue Program. He retired from the County in 1998. He has authored many articles for the various trade magazines such as Firehouse, Fire Engineering and Fire Command. He has lectured at the Firehouse Conference in Baltimore in 1998 and FDIC in Indiana this year. John has been lecturing to many departments for over twenty years. He is the director of Fire Mark Consultants; a company that specializes in fire related seminars. a) Members riding position, eg. where he/she is seated on the apparatus. b) Members assignment, eg. forcible entry, roor, chauffeur, etc. d) The SCBA assigned to that member for the tour. working with. It could be an officer just assigned for the tour. we refer to them as F. A. S. T.  units. (firefighter assist search team). need it. Hence, the F.A.S.T. concept was initiated. "NORMAL" TOOL ASSIGNMENT WITH ROOF SAW. Look at the fire conditions, and discuss what you  see. relief unit or if equipment is not necessary for operation. Will interior units be using them  ? Will that be the way to get into the building quickly ? Are they in place ? Are additional ladders necessary ? Get familiar with the controls, and make sure it is ready to be used. Stay at the turntable if the assigned chauffeur is not there. chauffeur is called into the building by his officer. Note any obstacles or problems the unit may encounter. REMEMBER THIS IS A SIZE UP ONLY. Subject: The award system the FDNY uses. lets see if I can help you out. Service Rating "B" which involved initiative or bravery . When a Unit performs above and beyond its normal function. example; an Engine company stretches a line and puts out a fire. out the fire.....(an idea of a Unit Citation). Honorable Mention: worthy of recognition, but does not fall under any of the above. of the unit or member and forwarded through channels. it is forwarded to the Board of Merit. in the report and the recommendation of the CIC, they will decide the degree of award. This board (Board of Merit) must meet at least quarterly and post its findings at the conclussion of the meeting. Medal Board:  This is another board that meets yearly, to decide what Class Awards (1,2 and 3 only) will be awarded a Medal of Valor. The fortunate members picked should receive their medal at a yearly ceremony where their peers and family gather to withness this achievement. Generally the Medals are pinned on the recipient by the Mayor of the City. Medals of Valor:  These are designed and struck by a compnay that makes medal. Many are pure gold and most are "other than gold". They are all different and usually are in memory of an important event or of a member of the service that died. Many of the medals of valor are accompanied with a cash award for the member receiving it. The higher the medal, the higher the award. They are expensive and should not be given away lightly. That is the system in a nutshell. If your department is serious about this and would like some help setting it up. They can hire me to come to your city and work with your people setting the system up. Since I am retired, I have the time, but they would have to pay my expenses.